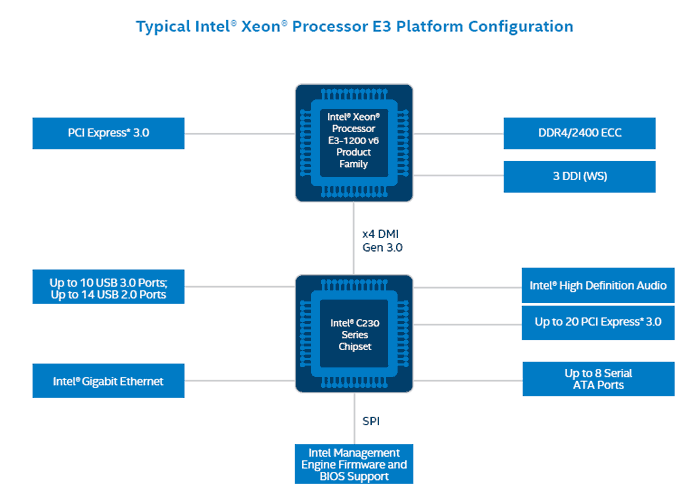 Intel has announced the availability of its Xeon processor E3-1200 v6 product family. A total of eight Kaby Lake Xeons have been made available and Intel asserts that they deliver "key improvements in processor speed, enhanced memory capabilities, hardware-enhanced security and reliability features with support for the latest Intel graphics". Alongside the usual targeted applications of entry-level workstations used in SMBs for design, analytics, and rendering, Intel adds buzz to this processor release by describing it as ready for professional virtual reality and 4K video. 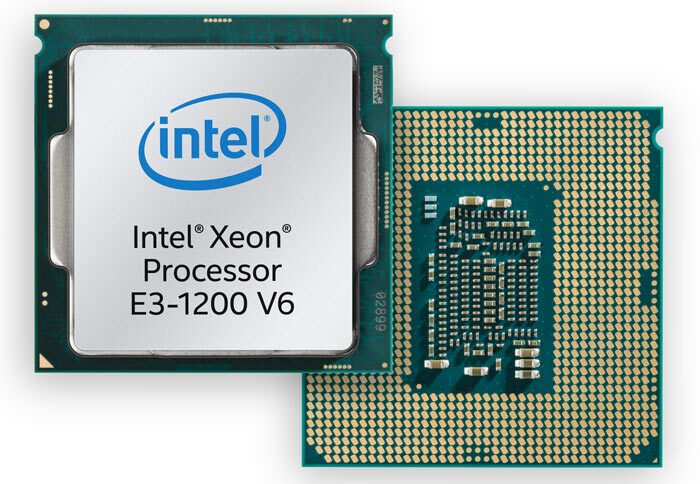 Making the case for upgrading to the new Xeon E3-1200 v6 product family, Intel has a number of comparisons to make with previous Xeons which are just a few years old. Headline computing performance will be up to 56 per cent improved compared to an E3-1200 v6 processor, it says. In another key metric, where SKUs have built-in graphics chips, the Intel HD Graphics P630 in the new Xeons can provide up to 3x graphics performance of an Intel Xeon E3-1280 v2. Add to this HVEC 10-bit hardware video acceleration and 4K video de/coding. With the P630 "designers may no longer need a discrete graphics card for some of the most commonly-used workloads," reckons Intel. Intel has made a simple table to make clear the Xeon with integrated graphics benefits, as below. Another big reason for going Xeon is the certified and optimised performance in popular workstation applications such as AutoCAD, Maya, Micro-Station, Solidworks, Photoshop, and many others. Intel goes on to trumpet Xeon v6 virtualisation technology, vPro technology, hardware enhanced security like Intel Software Guard Extensions (Intel SGX), and Optane compatibility, and ECC memory support as reasons to opt for the platform. Looking more closely at the Intel Xeon processor E3-1200 v6 product family product matrix, we can see that they are all quad-core parts; six of them are in 4C/8T configuration, and the two cheapest models are 4C/4T. To make use of one of the new Kaby Lake Xeons you will need to have an Intel C230 series chipset motherboard, specifically either the Intel C232 or C236 chipsets. At least this makes them viable as upgrade options for those who already bought into C230 chipset socket 1151 boards,with probably only a BIOS update required for support. Intel says the Xeon processor E3-1200 v6 product family is available immediately. But will they too require Windows 10? Can't believe the enterprise sector will be happy having Windows 10 foisted upon them. Sooner or later, the enterprise sector is going to have to adopt Windows 10 or migrate to a different ecosystem. End of support dates are looming ever closer……. I would be that these processors are for fairly unique workstations more than standard builds in Enterprises. They're too powerful for most users and not powerful enough to get put into servers. They are for run-of-the-mill workstations, which means applications like CAD/CAM, development etc. I'm typing this sitting in front of my workstation using an E3-1245 v2 at work. Common office tasks are usually done on simple desktop pcs, albeit often using a “business” Q-series chipset for the management options. What is the point of the E3-1280v6!!?? $300 more than then E3-1270v6 for 0.1GHz more, absolutely crazy! !